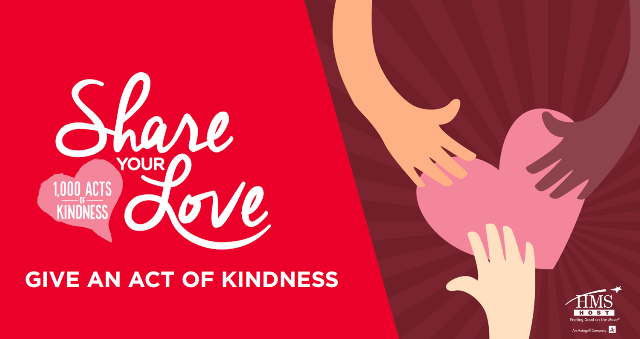 Concessionaire HMSHost is incentivizing travelers to perform random acts of kindness at U.S. airports with its new Valentine’s Day-themed Share Your Love Campaign. As part of the campaign, HMSHost is encouraging airport passengers to write notes of encouragement for children’s hospitals. Share Your Love also features a signature Valentine’s Day-inspired cocktail and a social media contest to promote spreading joy outside of airports. Travelers who participate in the card-writing program will receive a premium dark chocolate bar and a Valentine’s Day card that includes a 15 percent discount at participating HMSHost dining locations. HMSHost’s goal is to deliver 1,000 Acts of Kindness throughout the airport community during the next few weeks. Travelers will be encouraged to choose an act, ranging from providing a box of chocolates to a flight crew to buying coffee for the person behind them in line. HMSHost will provide those items to incentivize the acts of kindness.